3-STRIPES LEGGINGS SPORTY LEGGINGS WITH AUTHENTIC 3-STRIPES STYLE. The instantly recognisable ..
3-STRIPES TIGHTS 3-STRIPES TIGHTS MADE IN SOFT, STRETCHY FABRIC. These tights have a timeless ..
ADIBREAK PANTS SPORTY FLARED PANTS WITH SNAP BUTTONS. Recognizable 3-Stripes down the sides of..
ADIBREAK TRACK PANTS TRICOT PANTS INSPIRED BY ARCHIVAL '90S BREAKAWAY STYLES. adidas Originals..
ADIDAS Z.N.E. PANTS PANTS BUILT FOR DISTRACTION-CUTTING COMFORT. The adidas Z.N.E. collection ..
ALPHASKIN SPORT 3-STRIPES SHORT TIGHTS SHORT TRAINING TIGHTS WITH A COMPRESSIVE FIT. As a base..
ALPHASKIN SPORT TIGHTS VENTILATED TIGHTS WITH A SNUG, SUPPORTIVE FIT. These training tights ar.. BELIEVE THIS 3-STRIPES TIGHTS STRETCHY SNUG-FITTING TIGHTS WITH A VENTILATED LINING. These wom.. BELIEVE THIS HIGH RISE HIGH-RISE 7/8 TIGHTS SOFT TIGHTS MADE FOR MOBILITY. From Downward Dog t..
COEEZE TIGHTS SOFT, COMFORTABLE TIGHTS MADE WITH ORGANIC COTTON. Wear them 24/7. These tights ..
Condivo 18 Training Pants Conquer the training pitch in these women's football pants. Climacool b..
CUFFED TRACK PANTS SIMPLE, SPORTY PANTS MADE OF FRENCH TERRY. The authentic look of adidas spo..
CYCLING SHORTS SLEEK, STRETCHY SHORTS INSPIRED BY CYCLING DESIGNS. These shorts celebrate the ..
DESIGN 2 MOVE 3-STRIPES HIGH-RISE LONG TIGHTS BODY-HUGGING TIGHTS MADE TO MANAGE MOISTURE. Mov..
DESIGN 2 MOVE HIGH-RISE LOGO TIGHTS SWEAT-WICKING TIGHTS MADE FOR COMFORT AT THE GYM. Cycling ..
FLARED TRACK PANTS AUTHENTIC SPORTS STYLE IN A FRESH, FLARED SILHOUETTE. These flared pants co..
HOW WE DO 7/8 TIGHTS RUNNING TIGHTS MADE OF SWEAT-WICKING FABRIC. Stay dry in these running ti..
ID GLORY SKINNY PANTS FITTED PANTS WITH A LOOK ROOTED IN SPORT. These pants strike the sweet s..
ID STADIUM PANTS SPORTY PANTS FOR THE OFF-DUTY ATHLETE. From your pre-gym coffee run to post-w..
JUMPSUIT A MODERN JUMPSUIT WITH DRAMATIC PROPORTIONS. Defy the expected. This jumpsuit blurs t..
JUMPSUIT RELAXED-FITTING JUMPSUIT WITH A TAILORED LOOK. Take runway style to the streets. This..
MUST HAVES 3-STRIPES TIGHTS STRETCHY TIGHTS FOR POST-GAME RELAXATION. Find calm after the chao..
MUST HAVES BADGE OF SPORT TIGHTS EVERYDAY LEGGINGS WITH A GENEROUS STRETCH. Reward your hard w..
OWN THE RUN TIGHTS REACH TOP SPEED IN THESE BREATHABLE RUNNING TIGHTS. Chase your goals. These.. PANTS RIBBED TRACK PANTS INSPIRED BY '90S BASKETBALL STYLE. These pants are inspired by '90s-e.. SPORT ID MESH TIGHTS HIGH-RISE LEGGINGS WITH MESH PANELS. 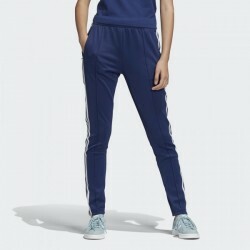 A streamlined take on a sportswear l..
SST TRACK PANTS SPORTY TRACK PANTS WITH 3-STRIPES STYLE. A sporty essential infused with moder..
SST TRACK PANTS SPORTY TRACK PANTS WITH 3-STRIPES STYLE. A sporty essential infused with a mod.. THE PACK TIGHTS SOFT LEGGINGS THAT ARE SPORTY AND COMFORTABLE. These tights push athletic styl..
TIGHTS COTTON JERSEY TIGHTS WITH RIBBING AROUND THE 3-STRIPES. Retro '90s B-ball style influen..
TIRO 19 TRAINING PANTS BREATHABLE PANTS THAT ARE BUILT TO MOVE. Train hard. Stay cool. These s..
TRACK PANTS MODERN TRACK PANTS WITH DRAMATIC PROPORTIONS. The adidas track suit is the uniform..
TRACK PANTS MATTE SATIN TRACK PANTS WITH A ROOMY GAUCHO CUT. Clean, minimalist design inspires..
TREFOIL TIGHTS EVERYDAY TIGHTS WITH ARCHIVAL 3-STRIPES. Pulling inspiration from the archives,.. WARP KNIT HIGH-RISE 7/8 TIGHTS SUPPORTIVE TIGHTS MADE FOR EASY MOVEMENT. Find your rhythm on t..
WOMEN'S ALPHASKIN SPORT LONG TIGHTS COMPRESSION-FIT TIGHTS WITH VENTILATION. Designed for comf..